I know it was just a month ago that I first posted about Lily Elsie, but I find her so beautiful that I had to do another post so soon! 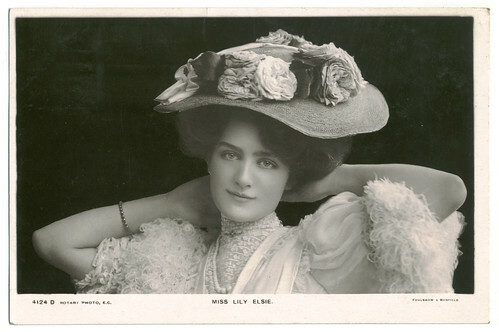 Lily Elsie (LE): They called me Little Elsie. Spencer Edwards (SE): It may be supposed, then, that you commenced your professional career when quite a child? LE: That was so. I sang ballads. Some friends were flattering enough to call me the infant Patti. SE: And you took to the stage, I suppose, as the duck takes to water? 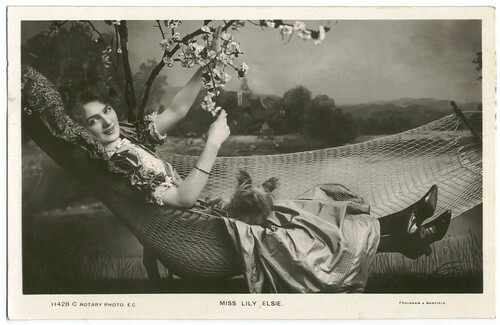 LE: Well, I played in the pantomime Red Riding Hood [at the Queen's Theatre, Manchester, Christmas 1896] when I was only eleven years of age, and, subsequently, I went to the [music] halls. My first regular engagement for theatrical work was a tour of M'Kenna's Firtation [a farce by E. Selden, first produced at the Opera House, Coventry, 1 August 1892]. SE: A natural sequence, I see. First the flirtation, then regular 'engagements,' and now the honeymoon - A Chinese Honeymoon. LE: You may put it that way if you like (laughing sweetly). Lily Elsie with her toy terrier dog. What a sweet interview, thanks for posting!! "And you took to the stage, I suppose, as the duck takes to water?" - how wonderful is that - I love their old english. She's divine. How stunning are those photos! She was absolutely beautiful.